Published by Cyril Huze May 20th, 2016	in Builders, Customs, Editorial and Events. 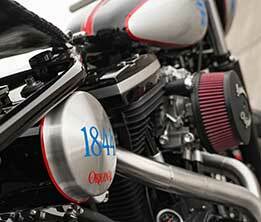 Past Brewing Company, established in 1844, and whose Pabst Blue Ribbon beer sales are experiencing a revival after a 2 decade-long slump, got the good idea to ask Brandon Holstein of The Speed Merchant to build a custom bike to benefit Operation Homefront and military families during the month of May, Military Appreciation Month. 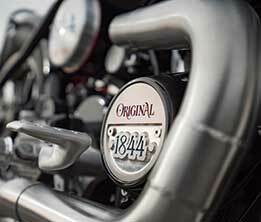 Starting today, the bike is auctioned Here On eBay with an opening bid price of $1.00 for a custom motorcycle valued of $25,000.00, It will be sold to the highest bidder. 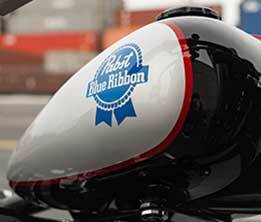 Pabst Bewing Company will match the sale price of the bike, with all of the proceeds plus the match being donated. To bid, go to Pabst Blue Ribbon. To bid, go to Pabst Blue Ribbon eBay Auction. That’s a great looking bike. 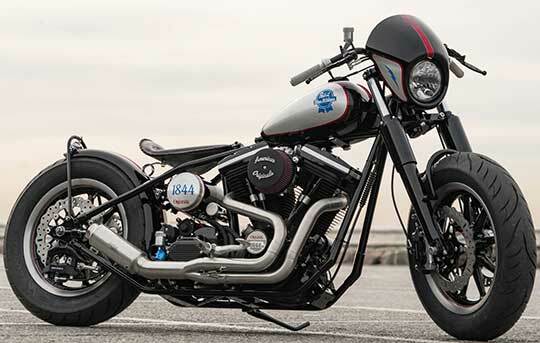 My back couldn’t do rigid, but I sure love the front end/fairing and the upswept exhaust. I’m curious what triple trees those are? Bagger dual disk front end with those radial mount calipers, sick. The vintage look will never go out of style. Not as long as there are still people who understand and honor the Legacy. Unlike the pipes in the story right above this one, those pipes actually flow with the bike. Very nice. PBR, brings back memories of me stealing my Pop’s beer out of his shop frig. Two out three not bad!